10.2 mi | 7 hr. I paired up with a new partner today just so I could get out in the snow. I soon found out that he had hiked the AT a few years ago and that he is a very strong hiker. I huffed and puffed to keep up. We carried snowshoes, although we never needed them, and that extra weight really slowed me down. It took forever to reach Imp Face, where we had our first chance at a view. But it had been snowing lightly all day, meaning there was poor visibility all around. As we walked towards North Carter Trail we began to encounter a large number of blowdowns. We climbed over, crawled under and bushwhacked around too many trees for me to count. My energy level dropped significantly. Towards the next junction I was exhausted and needed to stop for a food break. We stopped and ate, talked, and rested for awhile. I was nervous about being the slowpoke but my partner reassured me that he didn’t mind waiting until I was ready to keep going. After we picked up and started walking again it was no time at all until we reached Middle Carter and posed for some triumphant photos. We looked at the map and decided we’d better turn back here, heading back mostly the way we came. I felt much better now that we were heading downhill. I was glad to have my Yaktrax for purchase on the icy trails. While we didn’t get any views today, I still had an awesome time in the mountains. 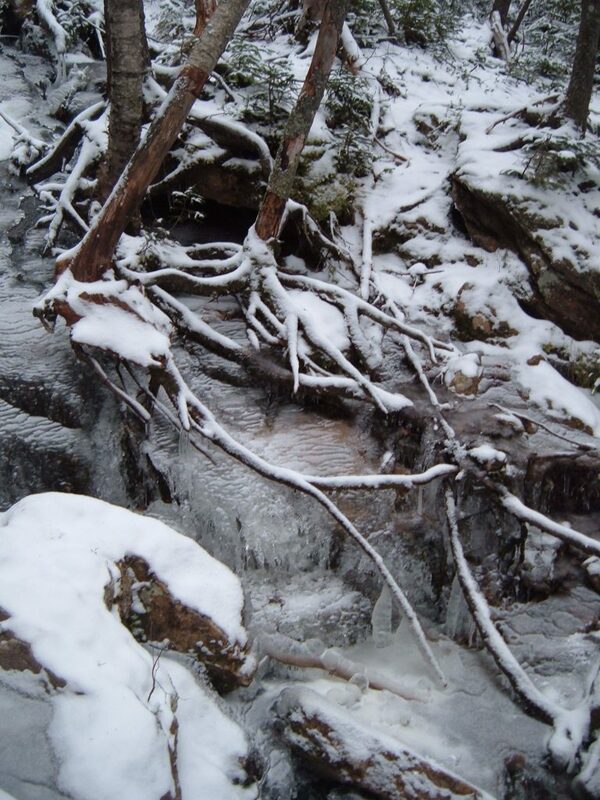 This entry was posted in Hiking, New England and tagged hike366 on December 4, 2005 by Jess B.